Will the fine wine investment market ever get over its image problem? The answer to that largely depends on whether or not you think it has an image problem in the first place. The question is provocative but important. Stories of wine investment scams and fraudulent brokers make headlines on what seems like a weekly basis, while at the same time our inboxes are flooded with research reports, news articles and marketing literature that tout the benefits of wine investment for the everyday investor. Never mind that the Financial Conduct Authority has clamped down on the promotion of alternative investments to retail investors — fine wine as an investment is not regulated by the FCA anyway. A recent fine wine investment report published by Intelligent Partnership and sponsored by Cult Wines has made for some interesting reading, although the bulk of its contents are not particularly groundbreaking. Nevertheless, the report makes several claims about the investment potential of fine wine that I believe need to be challenged. The first entry that gave me cause for concern was a rather bizarre pull-quote that made the report read more like an article out of a tabloid newspaper than a serious research outfit. Is this the image that they really want to portray? Accompanying this statement in the report is a chart that plots the performance of global equities and government bonds against the Coutts Objects of Desire Index, which includes not only fine wine but also classic cars, stamps, coins, rugs, rare musical instruments and so on. The problem with this is that the Coutts index, as shown in the chart below, does not reflect the pure performance of wine because it contains so many other assets. Therefore, its behaviour in 2008 seems almost benign in 2008 when compared against other major asset classes (the precise make-up of which is not divulged in the report). A glance at the historic performance of any of the major Liv-ex indices (Liv-ex Fine Wine 50, Liv-ex Fine Wine 100, Liv-ex Fine Wine Investables) will show that fine wine prices actually went through a correction in late 2008 just like many other global stock markets (see chart below). For example, the Lix-ex Fine Wine Investables Index saw a correction in the region of 20% in the second half of 2008 as it fell to a reading of 198 on 21 December 2008 from a peak of 248 on 30 June 2008. That is a fairly standard market correction. Moreover, the index started a multi-year bull run beginning in early 2009 just like many other global stock markets. This bull run lasted until 2011 when the market entered a major structural downturn that saw prices for Bordeaux wines fall across the board for several years. 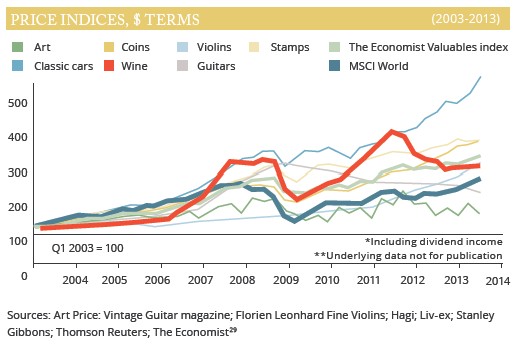 The below chart from the Intelligent Partnership report shows not only the 2008 correction that fine wine exhibited (thick red line), but also the slump that began in 2011. The reasons for the 2011 downturn are various and widely documented. Unfortunately, the report only makes a brief mention of some of the causes for this and for the most part excluded a proper analysis of why the market for investment-grade wine began to slump in 2011. There is no mention of recession, volatile stock markets, the eurozone sovereign debt crisis, correlations with market and economic events (more of which later), a revolt against ever-higher en primeur prices, and so on. This is valuable information for any potential investor. Wine might appear to be an attractive investment right now as a result of the prolonged downturn in the Liv-Ex 100 over the past five years, but that does not necessarily make it a perfect buying opportunity either. Yet this always seems to be the primary message coming from newspaper articles and research reports into the fine wine investment market. Although fine wine investing shows a very low correlation to mainstream financial markets, it is heavily exposed to emerging markets and China, “which many will regard as being a risk as well as an opportunity”. The key is to ensure that a portfolio is correctly balanced in terms of the markets invested in. True, this can create an opportunity. Lower prices make a great entry point for investors. But for those who want to be fully aware of the risks, let’s look at some worrying levels of correlation that suggest that wine has anything but a ‘very low correlation’ to global markets. As a luxury product, wine is geared into global growth and rising wealth levels. That explains why it boomed when Japan was booming, it boomed when the US was booming and it boomed again when China was booming. It also explains why there was a slump following the global financial crisis in 2008 and again in 2011 when China’s government began cracking down on corruption. The right fine wine investment can be a very defensive holding as it has the capacity to remain stable under difficult economic conditions. Additionally, it has the advantage of not necessarily following the general trend of lagging behind the rest of the market during economic expansion because demand is consistently strong. Consistently strong? During economic expansion, yes. But investors want to know about what happens when the opposite is true. What happens during an economic recession? What happens when the economy isn’t doing so well and conditions deteriorate? In the case of China, the buyers stop buying. And then there is the market correlation everyone seems to have forgotten. Crude oil. Two economists at the International Monetary Fund were studying the factors that drive commodity prices upward and found that fine wine has a strong correlation with the price of oil. Our results suggest that although fine wine can be considered as an investable asset, its behaviour is not significantly different than other commodities and therefore may fail to enhance portfolio diversification. Fine wine prices are sensitive to macroeconomic shocks, just like crude oil and other commodity prices. Not all is bad about this report, despite my critical statements. It does highlight the risks associated with investing in wine and it makes mention of the costs and expertise required to make informed decisions and ensure correct storage. I applaud the authors for discussing the downside to wine investment. My concern, however, is that it has not paid enough attention to the risks associated with fine wine and has downplayed the effect that global market and economic events can have on consumption and pricing. In the past, the small and relatively closed world of wine investment was sheltered somewhat from global events. This is no longer the case as more investors enter the market and globalisation takes hold.